One-of-a-kind with panoramic views and balconies, equipped with every comfort; and, on request, there is the possibility of triple or quadruple accommodation. 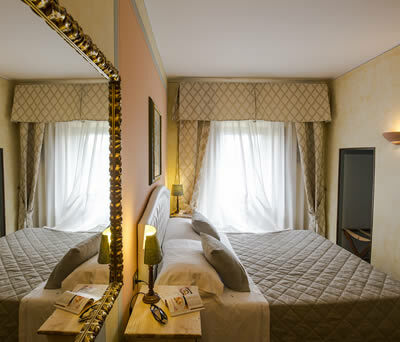 Each Deluxe Room carries the name of one of the famous chocolates from the famed chocolate factory (Bacio, Bacio in Rosso, Seneca and Cartigli). Many are the amenities included: SKY satellite T.V., accommodation and breakfast, free WI-FI, an apéritif on arrival, an enhanced set of complimentary toiletries, free Internet, minibar, herbal infusions and a vast choice of teas, kettle.